Inner City Press; there has been this ongoing problem in western Papua where there was a crackdown, there were people that were cracked down on by the Government, so various advocacy groups had the people cracked down on are saying both the Secretary-General to [United States] President [Barack] Obama, the various people that are going to Bali that, wondering whether this issue will be raised in any way. Do you know, I mean, you say don’t prejudge, but I guess there must be, sort of, talking points and a plan of action. 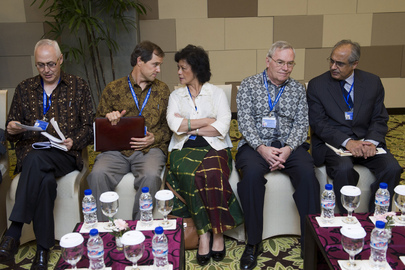 Does the Secretary-General plan to raise any Indonesia-specific issues while in Indonesia, including this one? Spokesperson Nesirky: Let’s wait and see. I do not know the answer at this point. Let’s wait and see. Okay, other questions, please? All right, okay, thank you, and have a good afternoon. Nesirky never got back with an answer, but his Office e-mailed out read-outs of Ban's meetings in Indonesia -- no mention of human rights, much less West Papua. In fact, Ban was even asked about human rights, and answered only in terms of the Millennium Development Goals, ignoring the human rights question altogether. Q: In spite of progress made, there are still some challenges for ASEAN, such as inequalities, human rights, economics, and good governance. What does the United Nations think about this? SG: Clearly there are gaps, inequality, between rich and poor and between the groups. This is one of the serious challenges we have to address. The MDGs [Millennium Development Goals], which were adopted by world leaders in 2000 with a deadline of 2015, is now making progress. But we are experiencing different scorecards the scorecard for progress is uneven. That is what we also see among ASEAN countries. However, I'm encouraged. I'm optimistic that with such strong solid among ASEAN countries, expanding their cooperative relations with other areas, with strong political commitment and leadership, most of the ASEAN countries we hope will be able to realize most of the goals of the MDGs. For example, Indonesia has already hit the target when it comes to cutting in half extreme poverty. They have made good progress in education and gender empowerment. But there are some areas in which they have to do more. I raised this issue with ASEAN leaders this morning during the course of the UN-ASEAN summit meeting and I'm raising this issue with all the leaders, all the leaders. There is some scepticism [as to] whether we will be able to meet the target by 2015, but with strong political leadership supported by resources, adequate resources, I think this is still doable. What will happen after 2015? That we are going to discuss in 2013 at the United Nations General Assembly. I'm now working on that. And so it goes at Ban's UN. Watch this site.